This month's box was full of surprises. I stuck with Classic with a Twist this month and it did not disappoint. 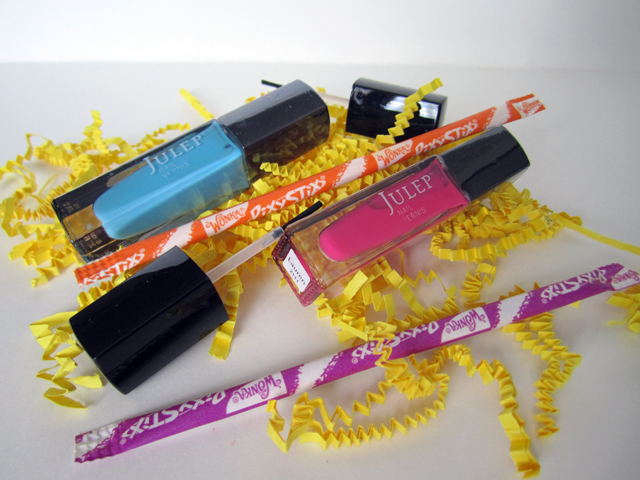 On top of two beautiful nail polishes, I received a tube of sunscreen, a lip balm, extra brushes (for the messed up brushes in last month's box), and two pixy stixs! Do you remember Pixy Stixs? Basically sugar flavoured sugar, i.e., delicious :). A bright pink, almost neon. 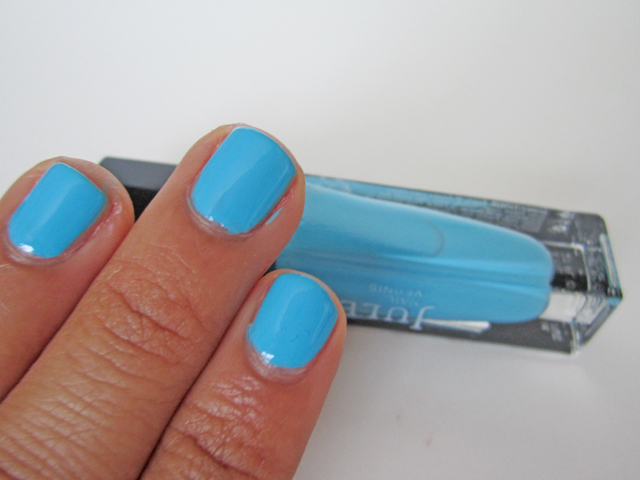 Two coats for a beautiful opaque color. It has a shiny, creme finish. A bright sky blue. Again, great application. Two coats and it's opaque. Beautiful creme finish. Both of these colours look amazing together! 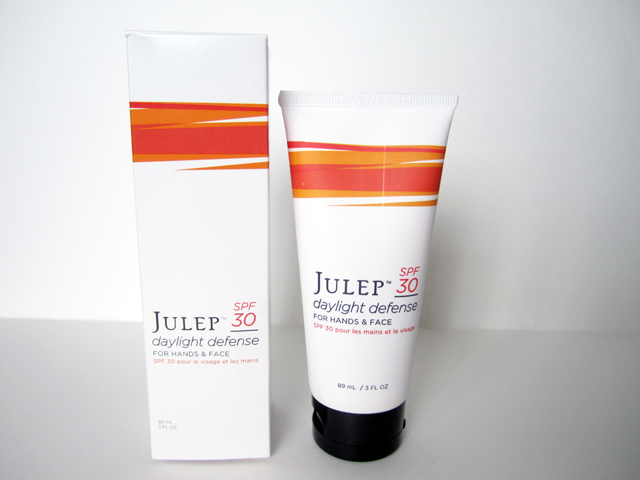 An SPF30 sunscreen for the hands and face. I always put sunscreen on my hands, but some people forget. Often your hands are the first tells as to your age, so it's important to keep them protected. It applies great and it has a (very) faint citrus scent. A vanilla mint lip balm with SPF15. It feels great on the lips. Applies smoothly and smells great. WHen you apply it, you will notice a slight tingling on your lips from the hint of mint. 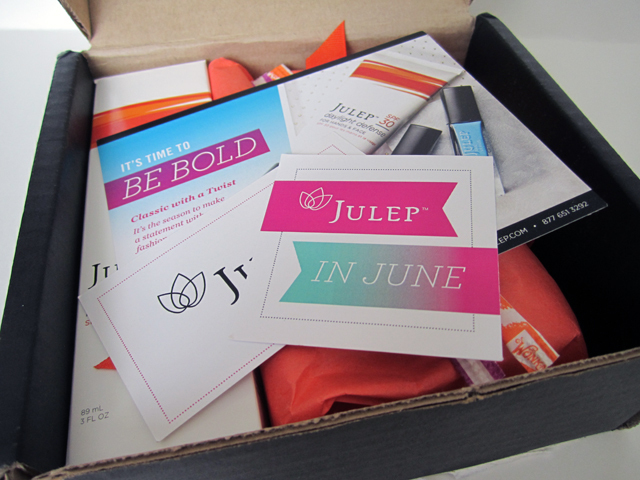 Did you receive a Julep box this month? Ps, what do you think of these pictures? My DSLR is out to lunch this week and next week, so I'm using my digital camera. It's been so long since I've used it, it's taking some getting used to.. I think your pictures still look stunning as always.. I got the same box as you.. my pixie sticks barely saw the light of day before they were gone...embarrassing!